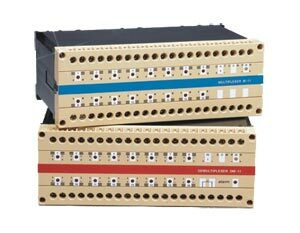 The DRA-MDM-11 is a mux/demux system which transfers analog information accurately via a single pair of wires. The multiplexer unit (DRA-M-11) accepts up to sixteen 4-20 mA process current inputs. The multiplexed inputs are transferred to the demultiplexer unit (DRA-DM-11) at a scan rate of up to 1000 channels/sec up to a distance of 2 kilometers (1.2 miles). At the demultiplexer the current outputs are reproduced in the same order and magnitude as the inputs. The demultiplexer is provided with an alarm (flashing LED and dry contact output) which is operated whenever there is any interruption in communication due to mux failure, cable discontinuity or short-circuit. Use of the DRA-MDM-11 mux/demux system enables a considerable reduction in cabling costs for a new installation or considerable expansion of analog data transfer capability in an existing installation. 참고: Comes with complete operator’s manual. Includes both DRA-M-11 multiplexer and DRA-DM-11 demultiplexer.